A Instituto de Investigaciones en Ciencias Veterinarias, Universidad Autónoma de Baja California, Baja California, México. B Facultad de Medicina Veterinaria y Zootecnia, Universidad Autónoma de Sinaloa, Sinaloa, México. C Ganadera Mexicali, Baja California, México. D Laboratorio Zoetis, Ciudad de México, México. 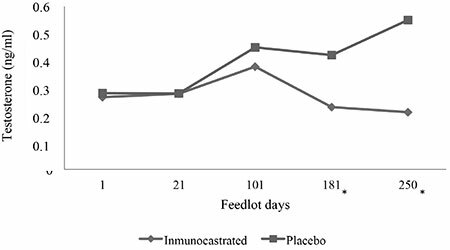 To evaluate the effect that immunocastration has on behaviour, testosterone and cortisol levels of feedlot Holstein bulls, 720 intact animals aged between 7 and 8 months, weighing 232±1.19 kg were randomly assigned to two treatments: immunocastration using the Bopriva vaccine and a placebo (360 animals per treatment). The bulls were slaughtered at day 239 of treatment. Animals were vaccinated on days 1, 21, 101, and 181, and on those same days testosterone levels were measured; while cortisol, glucose and creatin kinase measurements were done on day 181 and during exanguination at slaughter. Sexual, aggressive and social behaviours were evaluated and it was found that intact bulls showed a higher average of head butts, mounting, threats, flehmen sign and sniffing (P<0.05), no differences were found for vocalisations, lowering of the head and grooming (P>0.05). Testosterone levels in intact bulls remained at 0.47ng/mL throughout the study, however, by day 181 differences (P<0.05) were observed in immunised bulls, with values of 0.22ng/mL. At slaughter, testosterone levels were 0.21 ± 0.06 ng/mL in immunocastrated bulls and 0.54 ± 0.06 ng/mL in the placebo group. The use of immunocastration with Bopriva has shown to be effective to reduce testosterone, sexual and aggressive behaviours on Holstein bulls. Castration of calves for meat production is a common practice in North America, and the term refers to the in situ removal of the testicles of any animal species, to suppress their function. Castration is frequently used to reduce carcass lesions due to aggressive behaviour of noncastrated bulls and also to improve quality of meat. However, this practice affects the welfare of animals due to acute or chronic pain caused for the procedure (Rault et al 2011). Traditional castration methods are associated with high level of stress, reduction in growth rate, pain, long recovery periods (Becker et al 2012), and post-operative infections (Price et al 2003). Currently, the use of Holstein bulls for beef production is viewed as an attractive alternative by meat producers in northwest Mexico, because male Holstein calves are not required in the milk production system, and therefore may be acquired from dairy farmers at a lower price than beef calves, and the carcasses obtained are export qual ity. However, if these bulls are not castrated (Duff and McMurphy 2007) they develop an aggressive behaviour among them and against people making their handling difficult and increasing susceptibility to stress. To reduce both the aggressive and sexual behaviours immunocastration is considered an alternative to tradi tional castration as it decreases blood testosterone levels which results in easier handling and less stress for the animals, as well as obtaining carcasses with less lesions (Amatayakul-Chantler et al 2012). Immunocastration involves the administration of an analog of GnRH to stimulate an immune response (Rault et al 2011) to pro duce antibodies that would neutralise GnRH to inhibit the secretion of sexual hormones. Also, compared to surgical castration immunocastration requires less labor and equipment and is less hazardous for the animals and people (Price et al 2003). The objective of the present study was to determine if immunocastration had an effect on animal behaviour, testosterone, and cortisol levels utilising Holstein bulls in feedlots. The study was carried out in the city of Mexicali, Mexico, which is located at 32° 32’00 N, 115° 12’41W. The region is characterised by a dry desert climate with an average temperature of 34.7 °C (-5 °C winter and 50 °C summer), annual rainfall of 37mm, and a relative humidity above 50% (García 2004). Holstein bulls were purchased from a dairy farm be tween 7 and 8 months of age and with an average weight of 232 ± 1.19 kg. The animals were allocated to two groups as follows: four pens of 90 intact animals (placebo group) and four pens of 90 intact animals treated with Bopriva (immunocastrated group) (Zoetis Laboratories Animal Health, México). Each pen was considered as a single experimental unit. Each pen size at the feedlot measured 31 m long by 26 m wide with a capacity to house 100 an imals with a final average weight of 450 kg. However, in the present study only 90 animals were housed per pen to reach an average final weight of 600 kg. Treatments were randomly assigned to animals twenty-four hours after they arrived to the feedlot. Also, a routine handling protocol followed by the feedlot system in Mexico was followed and consisted of vaccination, deworming, and placement of an implant (dose of trenbolone acetate, estradiol and tylosin). The vaccinated group received 4 doses of Bopriva subcutaneously at 24 h after animal arrived, and on days 21, 101 and 181 of the experiment), while the calves in the placebo group received 1 ml of saline solution on the same days. The animals were fed twice a day, following a program of six diets, a protocol commonly used in the northwest region of Mexico that includes wheat hay, sudangrass, tallow, dried distillers grains (DDG), and a mineral premix. The animals were slaughtered once they reached an average weight of 580 kg at day 239 of the experiment. Prior to slaughter cattle were kept in rest pens with access to water for approximately 6 hours. On the day of slaughter the animals were herded by a handler on horseback for about 1 km to the slaughterhouse. Behaviour was evaluated by two observers per pen (treatment and control pens), and assessment was conduct ed by standing in the front of the pen for a better vision. Animal behaviour was assessed daily in each pen, one hour a day, twice a week, the assessment was done one day between 06:50 to 11:50 h and the next day between 12:30 and 17:40 h. The evaluation was performed in three stages: the first stage started on day 21 and concluded on day 101; the second stage was between days 102 and 181; the final stage comprised the last 7 days of the fattening period. The variables where evaluated by recording the number of events per pen: for sexual behaviour the variables mounting and flehmen sign were evaluated; the variables observed as aggressive behaviour were head butting and threatening; and for social behaviour the variables sniffing, grooming, lowered head, and vocalisation, were assessed. Mounting was recorded when an animal jumped on the back of another animal, while flehmen sign was accounted when a bull lifted its upper lip after smelling the genital region of other animals; head butting was recorded when two animals rammed their heads and pushed each other; the sign of threatening was considered when a bull low ered its head and pawed with the forefeet; sniffing was registered when an animal smell another animal; grooming was considered if a bull licked the head of another animal, neck or shoulder; lowered head was recorded as a sign of submission; finally, all types of vocalisations where considered as social behaviour and therefore recorded. Ten animals per pen were randomly selected to measure serum testosterone levels. Animals selected for serum sampling were identified using an additional ear tag. Blood samples were taken every time that Bopriva was administered, and a sample was also taken at the bleeding station on the production line at slaughter. Approximately 5 mL of blood were taken from the coccygeal vein. The samples were centrifuged at 3,500 rpm for 10 minutes to obtain the serum, using a TRIAC centrifuge (Clay Adams, Model 0200, New Jersey, U.S.A.), and stored at -20 °C until testosterone concentration was measured. Concentrations of serum testosterone were determined using the ENZO Testosterone Elisa Kit test (ADI-900-065), according to the instructions of the manufacturer. To measure stress parameters two additional blood samples were taken at day 181 of the experiment, during the last vaccination with Bopriva. The first sample was collected with EDTA anticoagulant to measure hematocrit, glucose and creatine kinase (CK), and the second sample was collected with sodium heparin to measure plasmatic cortisol. Also, additional blood samples were taken during slaughter of the animals to repeat these measurements. All samples were refrigerated at 4 °C and sent for analysis to the Laboratory of Clinical Pathology of the Institute of Veterinary Science Research at the Autonomous University of Baja California. To determine glucose and CK an enzy matic analysis was performed with automated chemistry equipment (SPIN 200, Spin React, Spain). Briefly, samples were tempered for two minutes and centrifuged at 3,400 rpm for 10 minutes on a clinical centrifuge (VE-400, VELAB) to separate the serum, which was placed in 1.5 ml Eppendorf microtubes. Glucose and CK was determined by the GOD-POD method where glucose oxidase (GOD) catalyzes glucose oxidation to gluconic acid. The hydrogen peroxide (H2O2) produced is detected by an oxygen, phenol, 4 aminofenazone (4-AF) chromogenic acceptor, under the presence of peroxidase (POD). The intensity of the color developed was proportional to glucose concentration pres ent in the sample. The creatin kinase reactive (CK-NAC), catalyzes the reversible transfer of a phosphate group from phosphocreatine to Adenosin diphosphate (ADP). This reaction is coupled with other reactions catalyzed by hexokinase and glucose-6-phosphate dehydrogenase. The speed of NADPH formation, photometrically determined, was proportional to the catalytic concentration of CK in the sample. Seric cortisol was determined with a Cortisol Test System (Accu-Bind ELISA microwells, Monobind, Inc., Lakeforest, CA, USA). To compare testosterone levels between treatments (Bopriva and placebo) and its performance over time (day 1, 21, 101, 181 and slaughter), a time-repeated measures model was used that included the common effect plus the fixed effects of treatment, time factor, treatment x time interaction and the random effect of experimental error. To study the treatment x time interaction, a covariance structure was modeled between the records, evaluating three possible covariance structures: unstructured, com pound symmetry and first order self-regression, using the Akaike and Schwartz criteria, the best one being the one that presented lowest values for these two indicators. In order to analyze the behavioural variables (mounts, head butts, threats, flehmen, sniffing, grooming, low head and vocalisations) by treatment effect, records were obtained through 47 visits during three post-vaccination periods (21 to 101 days, 102 to 181 and 182 to 7 days before the end of the finishing period). The analysis was performed with the average value divided by total visits. The differences between treatments in their behavioural form during the periods were analyzed using a linear model that included the fixed effects of treatment and the interaction treatment x period as a covariable plus the random effect of the error. The comparison between slopes was performed with the Student’s t statistic and the comparison between means of treatment was performed using means adjusted by the covariable in the model, the significance was declared for P values <0.05. The analysis was performed using the SAS 9.4 statistical package with the Proc GLM procedure (general linear model). The ESTIMATE statement was used for the comparison of slopes, and the LSMEANS statement for the least squares means. The mean values for the behaviour variables evaluat ed per treatment are presented in table 1. The variables mounting, head butting, threatening, flehmen signals and sniffing exhibited the highest mean values (P<0.05) in the placebo group, while grooming, lowered head and vocalisations showed no differences between treatments (P>0.05). Figure 1 shows that the least square means ob served for testosterone levels by treatment on days 1, 21 and 101 were similar (P>0.05) between immunocastrated and placebo groups. Testosterone levels increased gradually until day 101 without significant differences (P>0.05) in both groups. In the placebo group, from day 181 until the end of the study, testosterone levels increased (P<0.05), while in the immunocastrated group levels gradually decreased (P<0.05). Table 1 Mean ± S.E. of behaviour variables during the fattening period. Figure 1 Concentrations of serum testosterone by treatment. *Feedlot days with significant differences (P<0.05). Table 2 shows the mean values of the physiological indicators of stress. Cortisol values only showed differences (P<0.05) per treatment, with the highest values observed in the immunocastrated bulls at exsanguination. The glucose values showed differences (P<0.05) over time. Differences were observed only among periods for CK, with the highest values being recorded at exsanguination. for both treatments Differences in these physiological pa rameters were expected in both groups, as those observed for testosterone levels and behaviour variables. However, the absence of differences might be due to a deficient animal handling previous to slaughter. Table 2 Mean ± S.E. of physiological indicators of stress. Immunocastrated bulls in this study showed an evident and effective decrease of sexual and aggressive behaviour related to low testosterone levels, results that agree with Jago et al (1997) who observed that uncastrated animals with high testosterone levels had an increase in the fre quency of agonist behaviour such as mounting and fights, among others. Other studies have reported a decrease in the frequency of behaviours such as mounting, threats, and head butts in immunocastrated males when com pared with uncastrated males (Huxsoll et al 1998, Marti et al 2015, Freitas et al 2015). These differences may be due to the effect that immunocastration has on serum testosterone levels where the synthetic GNRH contained in the vaccine (Bopriva™) stimulates the production of antibodies by the animal immune system. The antibodies block the GNRH receptors located in the hypophysis and therefore inhibit the release of the hormones FSH and LH that are responsible for stimulating the production of testosterone in the gonads, and as a result testosterone levels in bloodstream will be reduced (Herbert and Trig 2005). Freitas et al (2015) showed that there is a positive correlation among testosterone levels and the frequency of mounts and agonist behaviour, and they believe that high testosterone levels stimulate a homosexual behaviour. Therefore, when testosterone levels fall, also physical activity will be decreased and so sexual and aggressive behaviour occurrence will be reduced. These results are consistent with those obtained by Theubet et al (2010), who recorded values below 0.5 ng/ mL after the second vaccination on immunocastrated bulls. Jannet et al (2012a) observed a similar decrease in testosterone (<0.01 ng/mL immunocastrated bulls vs 14 ng/mL control bulls) in Holstein bull calves, while Jannet et al (2012b) recorded levels of >5 ng/mL in uncastrated and <5 ng/mL in immunocastrated bulls. Amatayakul- Chantler et al (2012) reported that immunocastrated animals showed a strong immune response against GNRH, which was associated with suppression of testosterone levels in the blood below 5 ng/mL. According to Palme et al (2000), cortisol levels aid as a reference parameter to evaluate stress in animals and may be increased when animals face a hostile situation (transportation, handling, different social environment) (Van de Water et al 2003, Bretschneider et al 2005, Amtmann et al 2006). The present study showed that during pre-slaughter management immunocastrated bulls exhibited a more docile behaviour that made them easily distracted and as a consequence they moved slower through the chute encouraging the excessive use of the electric cattle prods when animals were herded. This may explain the high levels of cortisol in immunocastrated animals at exsanguination in this study. When animals undergo a stressful event their blood levels of catecholamines are increased affecting the metabolism of carbohydrates (glycogenolysis and gluconeogenesis), so that there is an increase in blood levels of glucose and lactate (Bond et al 2004). However, Shaw and Tume (1992) stated that blood glucose level alone is not a reliable indicator of stress, so cortisol levels have to be considered altogether. Moreover, Mórmede et al (2007) sustain that the response to stress vary among species and is related to cortisol basal levels: cattle have low basal levels of cortisol (often lower than 0.54 ng/dL) and cortisol levels in response to stress can increase from 2.17 ng/dL to 7.24 ng/dL. Also, Mórmede et al (2007) indicated that serum glucocorticoid levels are affected by several factors such as time of day, season, and environmental factors; also, that cortisol levels differ according to the level of stress experienced by the animals during the experiment, and cortisol results differ among studies even when similar treatments were used because every individual respond different to a stressful stimulus in addition to environmental factors where the experiment is developed. Regarding the levels of CK found in this study, these were higher at exsanguination time than at day 181 when the last vaccine was applied. This might be due to the stress inflicted during mobilization of the animals from the feedlots to the slaughter house and also the pre-slaugh tering handling. According to Earley and Murray (2010), CK is an enzyme that is released from the sarcoplasm of the muscle cells into the bloodstream due to the increased cell membrane permeability in response to muscle damage and stress (Kannan et al 2000), and therefore high levels of this enzyme are a good indicator of muscle activity or damage, and similar to glucose, the increase in CK levels is attributed to the stress caused to cattle by a deficient handling prior to slaughter. The use of immunocastration in Holstein bulls may be viewed as an effective alternative to reduce the serum levels of testosterone and the sexual and aggressive behaviours, and therefore can help to reduce the levels of physiological stress indicators such as cortisol, glucose and CK. However, all these advantages may not be exploited due to a deficient animal handling practices at the slaughterhouse. Therefore, in order to ensure the successful performance of the vaccine it is important to modify and improve the animal management practices prior to slaughter. *Corresponding author: C Pérez-Linares; A. Obregón y J. Carrillo s/n Col. Nueva, Mexicali, Baja California, CP. 21100, México; cristinapl@yahoo.com.